Hurricane Irma has struck the Caribbean leaving devastation in its wake. Tens of thousands of people have been displaced. ACT Alliance members are currently assessing the situation in Haiti, the Dominican Republic and Cuba, and coordinating their response to Hurricane Irma. Through the ACT Alliance, PWS&D is able to respond to meet immediate needs like food, emergency non-food items, shelter, and water and sanitation services. 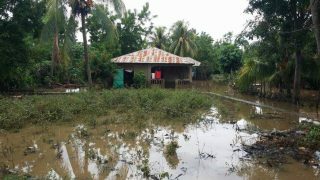 PWS&D is monitoring the situation with our long-standing development partners in Haiti. Read more about our ongoing work in Haiti. Please continue praying with us for the people and communities impacted by hurricanes this season. The PCC has posted a prayer for all those affected by Hurricane Irma. As needs are being assessed, PWS&D is accepting donations towards relief efforts. You can make a donation to PWS&D through your church, by mailing a cheque to the office, donating online or calling 1-800-619-7301 x291. Please mark all donations “Hurricane Irma.” Please give today.